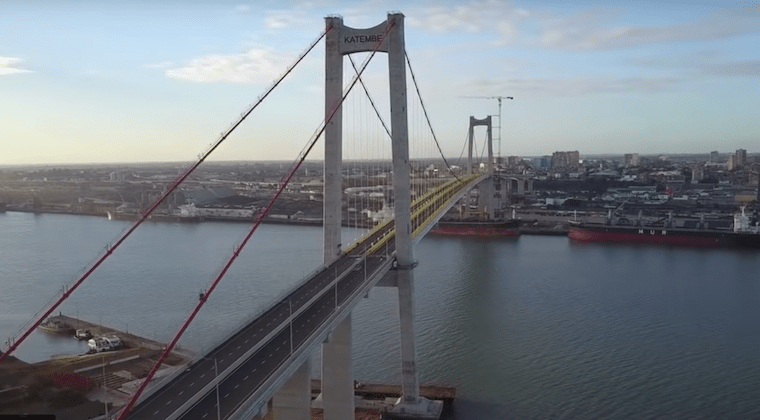 Mozambique has officially opened the Maputo-Katembe Bridge, a 3km-long (3 041 metres) suspension bridge that extends for 680 metres over Maputo Bay and connects the Mozambican capital of Maputo on the northern bank with Katembe on the southern bank. The twin-tower bridge also straddles the Indian Ocean inlet of Espirito Santo estuary. The bridge breaks the record as the longest suspension bridge in Africa previously held by the Matadi Bridge in the Democratic Republic of Congo. Its inception was part of an improved transportation network plan, as visualised by former president of Mozambique, Samora Machel. Its construction stalled due to civil unrest in the country and, although revived in 2008, fell through again until China’s intervention in 2011. After a long drawn-out settlement, China went on to channel US$785 million into the construction of the Maputo-Katembe Bridge over four years under the management of the China Road and Bridge Corporation. The loan agreements towards the financing of the project – like many others across Africa – are not public knowledge. Like the Source of the Nile Bridge in Uganda, which comes at a cost to locals because Boda bodas, the motorcycles commonly used by locals to transport just about anything, are forbidden from using it, the Maputo-Katembe Bridge will cost locals an exorbitant US$2.60 to cross.